I’m reading about John Clare, the nineteenth century English poet. He spent the last years of his life in a mental institution, suffering from delusions. One of these being that his unattainable, and by then long dead, first love would come to him. Earlier he had been courted by some of the better educated members of the aristocracy who were quick to drop him as soon as his mental health problems became apparent. I see parallels in the way the delusions of ordinary English folk are being fostered by the better educated members of the’ leave’ camp in this referendum about Britain’s membership of the EU. One such delusion is that we will have greater freedom to act in our own interests from outside of the EU. The fact is that we are now, and always have been, free to pursue our own best interests. Thirteen years ago the then British government pursued its own grand delusion, against the advice of European allies, and popular opinion at home. The disastrous invasion of Iraq, a decision based on the false delusion that the Iraqi government possessed weapons of mass destruction, has ramifications that continue today, not least in the exodus of people desperate to escape the horrors of religious wars in the Middle East. 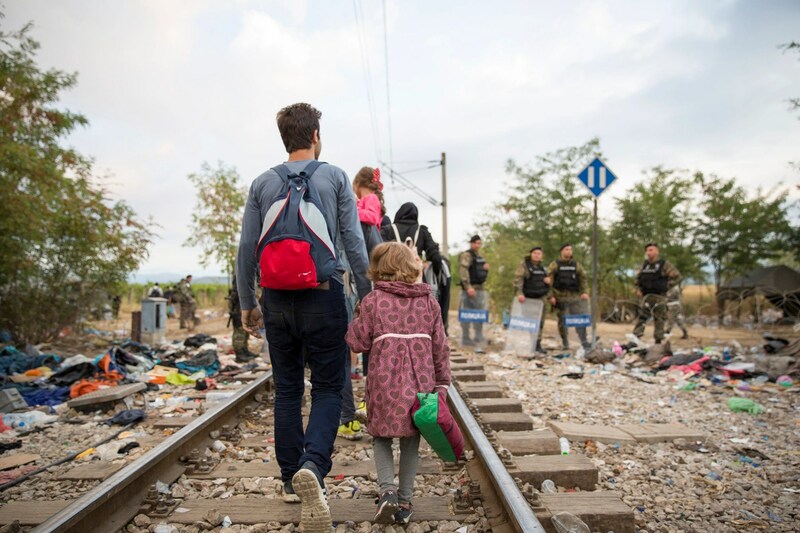 Refugees crossing the border between Greece and Macedonia. Image from amnestyusa.org. There can be no greater irony than the fact that the arrival of these refugees in Europe is cited as a reason for Britain to leave the EU. Another delusion is the one that says we were alright before the EU and will, therefore, be alright again after we leave. Stop and think for a moment. We have been members of the EU for 46 years. That means no-one under 60 has a first hand memory of what life was like back then. Of course the EU has evolved over that time and is not the same as it was when we joined. But we have played our part in shaping that evolution with our contributions to the contents of the Maastricht and Lisbon treaties, for example, which contain ‘opt-outs’ so that we are not tied-in to elements of those treaties that are not in our best interests. And then there’s the idea that the EU is undemocratic, that the other 27 member states dictate to us. In 46 years it’s perhaps not surprising that no-one seems to remember that we in Britain did not always elect our members of the European parliament. They were appointed by the government of the day. One thing the other members (then only 8 in number) did dictate, is that we should elect our MEPs, and do so by proportional representation. The first such election took place 37 years ago this month. It has been said often enough by now, but some people are apparently so deluded they do not believe it – no law or regulation comes from the EU that has not been agreed by the parliament and by the council of ministers representing every member state. Every one of the 28 member states can make that same claim, that it is being dictated to by the other 27, including Britain. The truth is that every member state fights its corner in the tortuous negotiations that precede the adoption of any new regulation. To pretend that Britain does not do well in such talks is insulting to those of our fellow citizens who conduct them. Nor should it be forgotten that, after we leave, those same people will be charged with negotiating new deals individually with each of the 27, as well as the rest of the world. The idea that they could achieve better results, faster, is surely the grandest delusion of all. John Clare’s poetry and pamphlets celebrated the English countryside and what he saw as its destruction by the enclosure movement. I suspect he would have welcomed those European regulations that aim to preserve the English countryside and wildlife by limiting pollution and encouraging the retention of hedgerows and other habitats. By franklparker in World Affairs on June 9, 2016 .